This course provides general safety practices for ATV use. Upon successful completion individuals will receive an Canada Safety Council Certificate. The All Terrain Vehicle Rider Course is a one-day program designed to train the operator in the safe and efficient use of an all terrain vehicle. The course includes both classroom and practical training, with the greatest emphasis on operational skills. The ATV Rider student and instructor courses are nationally recognized programs developed by the Canada Safety Council, for the benefit of both industrial and recreational ATV operators. You will be registered with the Canada Safety Council and receive your certificate and registration number. This course provides general safety practices, so, not only will you enjoy the day, but you will build confidence in your own riding ability and the ability to handle your machine. Course identifies the responsibilities of ATV riders as governed by the Alberta Government Occupational Health and Safety Code (Part 19) and Traffic Safety Act - Off-Highway Vehicle Regulation. Topics included operator responsibilities, safety equipment and inspection and maintenance. Completion of this course has become mandatory in many major companies for employees and sub-contracted personnel who use an ATV on the job site. The lessons include starting and stopping, quick turns, hill riding, emergency stopping and swerving, and riding over obstacles. Target Group / Participants:Oil and gas employees, foresters, emergency medical technicians, adventure travel companies, seismic and survey crews, ranchers, police and recreational users. Which means our instructors can bring the course to you and your site. Edmonton course's are offered twice a week all year round. You also have choices to pick another date or location within Alberta or Western Canada. If there is date you wish give us a call. Short notice courses can usually be arranged. 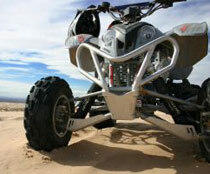 We have ATV's, helmets, gloves, goggles, etc available upon request. Hotels, meals, etc can also be arranged, we are here for you.